It is well established that growing up in Devon and family vacations spent in the Westcountry, have an influencing gravitation pull over house buyers wanting to return to the county. We are also familiar with the staycation phenomenon and according to data analysis, bookings have increased by almost a quarter compared to 2016. Buying a new build property in the South Hams has many advantages for both sets of purchasers. One of the driving forces for holidaying in the UK, is that so many of us just don’t want to leave our four-legged friends in kennels, whilst we jet off to foreign shores. Savvy purchasers are recognising the shortage of desirable properties that cover all of these lifestyle choices and Dartmouth is a hot spot this autumn. Hillfield Village nestles in a pretty sheltered valley, close to this historical naval town, that has its own microclimate. The diversity doesn’t end there though, a select number of bespoke homes at Hillfield are now available to purchase as main residences, holiday homes or rental properties. Sales have taken off recently as the product fits aspirational buyers short and long-term goals. Owners who buy for their own use can take their dogs. 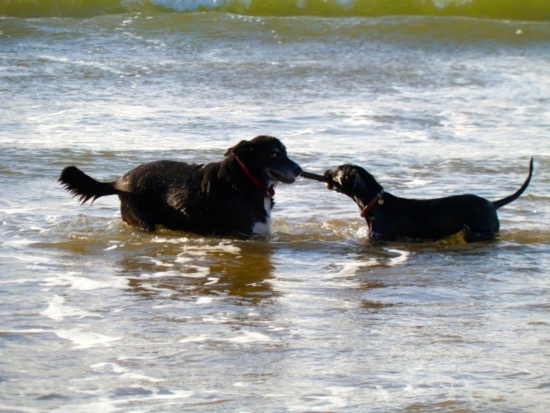 You can’t beat a bracing walk on dog friendly beaches at Strete Gate, Slapton Sands or Beesands Beach and finish up in The George and Dragon in Dartmouth with your canine friend at your feet. Another captivating location and forever home destination, is Salcombe. The Victoria Inn, just south of the harbour, is an award winning traditional pub with a great family garden. They pamper dogs and welcome them into all areas of the establishment, even offering a delicious ‘Al a Bark’ menu, with various chews and biscuits! Salcombe Rise, twelve new desirable 3 and 4 bedroom homes, has just opened its Marketing Suite and now is a great time to reserve off plan, to secure the house that best fits your needs and pet arrangements. Versant’s luxury specifications are ideal for coastal family living. East Portlemouth beaches are a short passenger ferry’s journey across the estuary; made up of a number of sandy beaches including Fisherman’s Cove, Smalls Cove and Mill Bay. The clear, clean shallow waters are safe for paddling both for man and dog. The Winking Prawn at North Sands is dog friendly, as is the beach. Man’s best friend can have a wonderful life in the South Hams and owners have more leisure time to join them, by buying a new build home in the Westcountry.